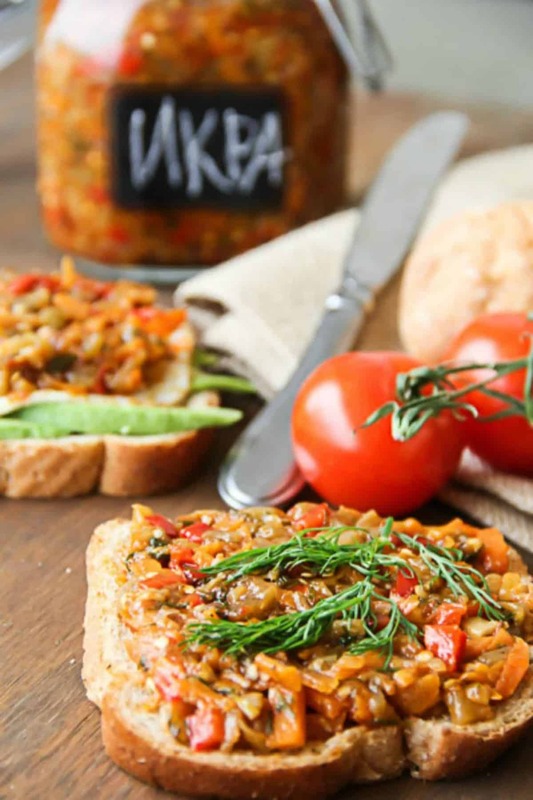 I love this braised vegetable spread (or ikra (икра) as we like to call it). 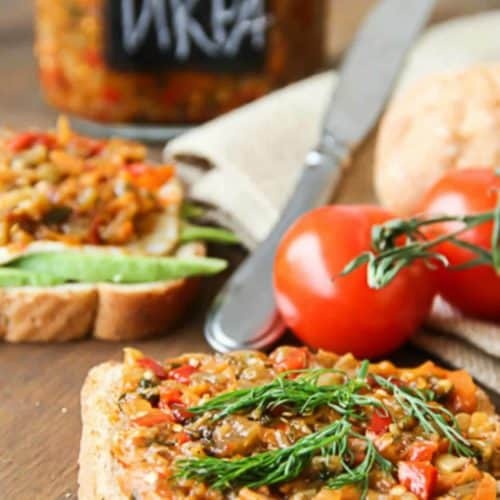 The recipe for this chunky spread is loaded with eggplant, carrots, onion, red pepper, herbs and is rather delicious. I am sure you have all had food you did not like growing up (or your hubby). As you get older some of the food you would have never eaten become rather delicious and you are like how did this happen? My hubby and I both were NOT vegetable lovers and especially something like this. It’s funny because now I always have some spread in the refrigerator and if I see we are running low I make more. We particularly enjoy this for breakfast. Some nights when the kiddos decide they will have a rough night and getting up a half an hour earlier to make breakfast for my hubby is really tough, this spread comes in handy. While my tea is brewing I make an over easy egg, top the egg with some spread, avocado if I have it and breakfast is served in like 5 minutes. We pray together, hubby leaves satisfied and I can get started on my day (or perhaps take another snooze if the munchkins are still sleeping=never happens, they are ALL early risers. Even Saturdays, why would get up at 7 if you could sleep in till say 9?:)..). Another tasty spread that I recommend is the zucchini spread(ikra). If you don’t like how chunky the vegetables are just GRATE all of the vegetable (minus the pepper and onion). Remove skin from eggplant and cube into small pieces. Lightly salt, mix and let sit about 5 minutes (this will take some of the bitterness out of the eggplant). In a large pan, heat 2 Tbsp oil on medium/hot heat. Once the oil is hot, add eggplant. Cook until soft, about 6 minutes. Grate one carrot and cube or thinly slice the second one. Finely chop onion. Cube pepper. In a deep pan, on medium/high heat add 3 Tbsp oil. Once the oil is hot add peppers, onions and carrots. Cook 10 minutes, or until vegetables are soft. Add the eggplants to the rest of the veggies, mix well. Move all of the veggies to side of the pan, lift pan and let any excess oil drain, discard of oil. Remove skin from tomatoes. Chop tomatoes. Add tomatoes (with juice), ketchup, herbs, garlic, salt, pepper and sugar. Mix everything. Cover with lid and let simmer about 5 minutes. Enjoy cold or warm! 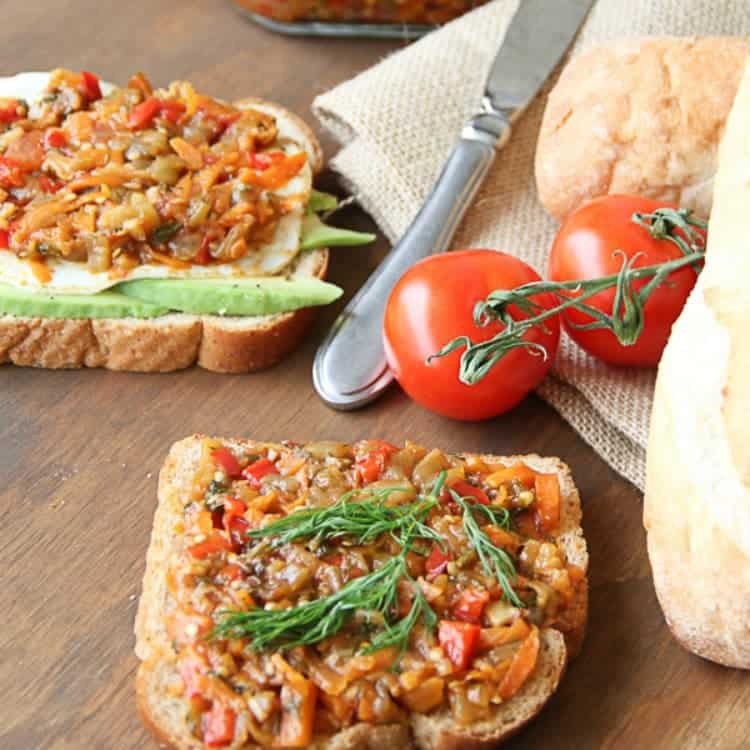 Eggplant, peppers, carrots, tomatoes and onions sauteed together to a smooth and rich spread. Remove skin from eggplant and cube into small pieces. Lightly salt, mix and let sit about 5 minutes. In a large pan, heat 2 Tbsp oil on medium/hot heat. Once oil is hot, add eggplant. Cook until soft, about 6 minutes. In a deep large pan, on medium/high heat add 3 Tbsp oil. Once the oil is hot add peppers, onions and carrots. Cook 10 minutes, or until vegetables are soft. Add the eggplants to the rest of the veggies, mix well. 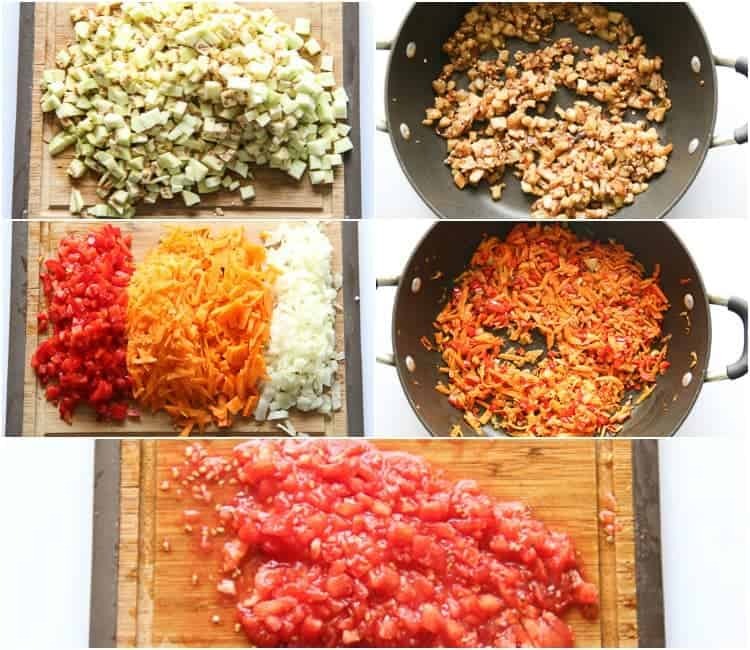 Move all of the veggies to side of the pan and let any excess oil drain, discard of oil. Thank you for the recipe, it was very delicious. I was wondering how long it can stay in the fridge and if it can be freezed? Thanks so much for the awesome feedback on the Eggplant Spread, Julia. 🙂 I’ve never tried freezing the spread so cannot be for sure how it would perform. The recipe will stay in the fridge for a couple of weeks. I’ve never had it last longer than that because we enjoy it so much for breakfast with eggs and avocado so it goes pretty quickly in our home. Amazing!! Will be gone before you know it.. thanks for a great recipe!! I made it for the first time yesterday because eggplant was cheap at the Asian store so I couldn’t pass it 😉 it was gone in 2 days (with our little family) goes well topped on top buckwheat. Yummy recipe! Will be making it again and again! Thanks! That’s wonderful, Oksana. Yes, you cannot pass up a good deal on eggplant. I’m glad your family enjoyed the recipe. We especially appreciate the feedback. Tanyush, I wish you could see the huge smile on my face from your beautiful comment. So happy when I find a recipe that everyone can enjoy, it’s a winner big time! Hi! I just wanted to thank you for this recipe bcs it was soo good! I had the spread on some homemade Russian black bread that I made in my bread machine and it was delicious! Oh that sounds wonderful!!. I’m thinking you need to share that Russian black bread recipe. E-mail me??.. This sounds yummy and I happen to have an excess of eggplants and tomatoes so I’m planning on making this today! I also have some zucchini that I would like to use, do you think I could add it to this ikra? Would that alter the taste too much? And how would I go about doing that if I were to add it? You definitely can Christina:). You can either double portion and do 1 large eggplant and 2 medium zucchinis, and just double the rest of ingredients, cook it the same way you would the eggplant. It will not change it too much, I often mix zucchini and eggplant. Did you also see my Zucchini Spread? It’s very similar, tastes wonderful (HERE). Zucchini Bars – these are out of this world good!!!!! Thanks so much for this recipe! I made it today, it turned out great and delicious! I absolutely love your presentation of it! This recipe sounds very easy, I’m printing it. Vadim loves this stuff, he will probably make it tomorrow :). It really is super easy and yummy!=^)..
Marinka, Madam, who likes this kind of stuff as a kid?? Hehe, teasing, but that’s pretty remarkable. And cabbage salad? Say what? You surely made your mom’s life easier. =o)…. Made this caviar today; was delicious! Thank you Valentina. I have a question for you- what kind of soup do you make most often at your house? Jessica, Oh that’s wonderful to hear!. Thank you for letting me know.=) I actually was just thinking the other day that I need to post some more soup recipes; we eat soups more than any other food. Simple soups are what we go for. Have you even seasoned your meat for soup? I always have seasoned meat in my fridge for soups (you can check how I season it in my borscht recipe and I do this to chicken thigh or breast, pork with or without the bone. It seriously takes EVERY soup to a whole new level.) My kids’ favorite is the Creamy Chicken and Potato https://valentinascorner.com/creamy-chicken-and-potato-soup/ and though none of them like broccoli, they love my Broccoli Soup so we have it very frequent. Will post my go to simple soup recipe as one of my next posts, it’s super easy and the whole family LOVES it. Thanks so much for visiting :)..
Have you tried canning this ikra? Jessica. This particular recipe I haven’t, however I do have a really yummy recipe I use that I hope to post if I find the time before canning is over=o)..
Valechka, I am back! 🙂 I love your recipes. I like to add sauted mushrooms when I make this spread. It just adds nice flavor. One of my elderly friend from Church suggested and I loved it. Tanyush!. You’re so sweet, Thank You for stopping back. 🙂 I absolutely love mushrooms, thanks for the genius idea, never thought of that! Definitely trying that:-)..
Looks delicious deffinatey want to try this I really enjoy this spread :)))this caviar is delicious!